Hands up those who can remember Michel Quoist’s Prayers of Life! As a teenager they had a profound impact on my sense of where God is to be found in the gritty realities of everyday life. From an ecumenical perspective, the prayer ‘Help me to say Yes’ broadened by Protestant understanding of Mary, with its line, ‘God needs my Yes as he needed Mary’s Yes’. Protestants have often, or even usually, ignored the biblical figure of Mary in reaction to what they see as the excessive claims of medieval and Catholic piety and dogma. They have even muttered such things as ‘Mariolatry’ (often while practising their own ‘bibliolatry’ – but that’s a debate for another day). In contrast, and prompted by Quoist, I have, each year during Advent, preached about Mary as a model of faith, an example to us on how to respond to God’s call – ‘Here I am, the servant of the Lord; let it be according to your word.’ I have even meditated upon the charismatic implications of the work of the Holy Spirit conceiving Christ within her. Then within a few pages he is talking of Mary’s soul as ‘absolutely full of the most perfect created sanctity’ (p101), and ‘We believe that hers was the most perfect sanctity outside the sanctity of God…’ (p100) I could quote further, but I expect you get the gist. I started muttering about the Vulgate’s mistranslation ‘full of grace’, about scriptural warrants for such ideas – and then tried to be eirenic and generous. The second thing was just the next day. I entered the first room of the Academia art gallery in Venice, with its medieval and early renaissance religious art, and found that nearly all the pieces were of Mary. Now, I’m very happy to spend time in front of pictures of the annunciation (Mary’s Yes) or images of the Virgin and Child (symbolic of incarnation) but when I realized that a third of the works in the room are representations of the coronation of the Virgin Mary in heaven – well – I had to take the weight off my feet and take stock. The first reaction was emotional and negative – then the reflection began and I tried to enter the world view of these artists and the spirituality that they express and provoke. Leave aside for the moment the theological qualifications and caveats – I worked my way through them apace. Yes, coronation speaks of hierarchy. Yes, Mary seems to be given a mediatorial role which should only belong to Christ. Yes, there are dogmatic formulations about perpetual virginity and ‘the assumption of BVM’ which Protestants find very problematic…. yes, yes. Here is a vision of the consummation of all things in which we all have crowns! Is it too big a step to see in the medieval vision of Mary’s coronation a prefiguring of our own destinies where ‘Love [bids] us welcome’ and gives each of us the place of honour. If this interpretation has any merit then the coronation becomes a symbolic representation of Mary’s place as the first Christian – chronologically – and, perhaps, prophetically. Her Yes makes room for the Holy Spirit to indwell and enable Christ to be born. She is, as eastern Christians say, the Theotokos, the bearer of God. 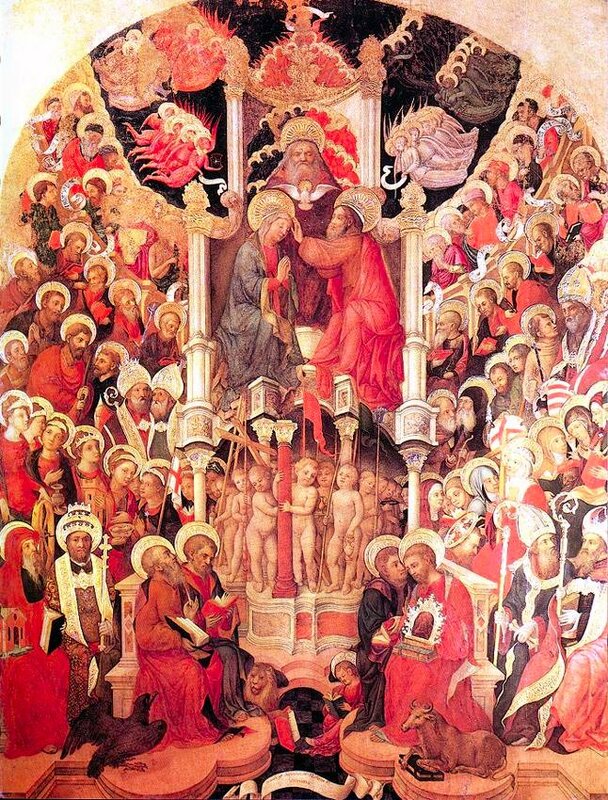 She also stands at the cross while most of the disciples ran away… And, perhaps, in these pictorial representations of her welcome in heaven we see the welcome that awaits all who trust in the child she bore for us and our salvation. So – back to Merton. No coronation here, he is talking of Mary’s poverty and lowliness as expressed in the Magnificat. It is because she is, of all the saints, the most perfectly poor and the most perfectly hidden, the one who has absolutely nothing whatever that she attempts to possess as her own, that she can most fully communicate to the rest of us the grace of the infinitely selfless God. This absolute emptiness, this poverty, this obscurity holds within it the secret of all joy because it is full of God.